GISquirrel allows you to view, edit and manage spatial data from Microsoft SQL Server or PostGIS in ArcGIS Desktop, using just a Basic/ArcView licence. No need for SDE, Server, Standard/ArcEditor or Advanced/ ArcInfo licences. In response to requests from GIS users all over the world, GISquirrel is now compatible with PostGIS as well as SQL Server. GISquirrel links ArcGIS/ArcMap with Microsoft SQL Server (2008 or later) or PostGIS, without SDE/Server or higher licensing levels. If you don't have SQL Server already, you can use the free "Express" editions. GISquirrel integrates spatial data with wider information management systems. GISquirrel is simple to administer, cost-effective, powerful and scalable. 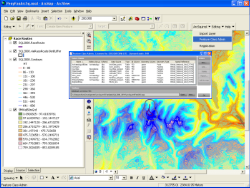 GISquirrel provides multi-user editing with an ArcGIS Basic (ArcView) licence. GISquirrel brings OGC-compliance for cross-platform interoperability. GISquirrel automatically manages spatial indexes and metadata. To find out what GISquirrel can do for you, why not download an evaluation copy. GISquirrel is written by exeGesIS Spatial Data Management Ltd, a software development and environmental data consultancy in the Brecon Beacons National Park, Wales, UK. We are an ESRI (UK) Ltd Solutions Partner. Our team of experienced software developers and systems analysts specialise in low cost GI solutions that integrate ESRI and open source applications. If you are wondering how to make best use of emerging open source GI applications, trying to work out the most cost-effective technology stack for your organisation, or if you simply want bespoke software development, then please contact us for an exploratory chat. Please visit our web site to find out more about us and our products.